Driven by unconditional love, refined by safety, and customized by design, cribs are a crucial piece to any nursery, in any country. However, the high standard demanded by the Canadian and American cultures call for a new generation of cribs, for the next generation of kids. They call for a crib that does not compromise design, is economical, sustainable, and holds true to all of the needs and safety requirements that ensure the healthy growth of a child. The Veränderung crib (German for change), employs Interlam’s ™ formaldehyde-free and eco-friendly, manipulated MDF board to create an unlimited amount of possibilities within a single crib. The interchangeable panels allow the consumer to have a multitude of options, pleasing any taste and enhancing every nursery. With the secure and simple z-clips, changing panels is easy and hassle-free. 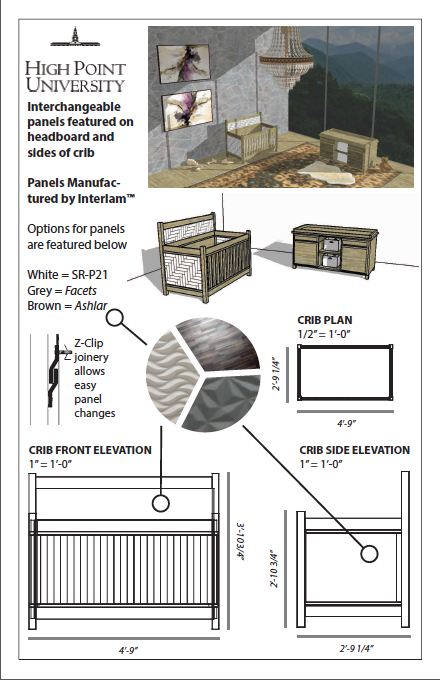 This allows the crib to adapt as style, desire, space, and the child changes. The Veränderung crib goes one step further and provides tools for this growth through the transformation of unused furniture parts after the conversion from crib to bed, and changing table to dresser. Taking the sides of the crib and the changing table top of the dresser, the sides become trestle legs as the top is flipped over and screwed in to form a free-standing, functional desk. This provides the child with the space to grow intellectually, artistically, and scholastically as they now enter a new realm of “big-kid” beds and take-home school work. The Veränderung crib advances alongside the always-changing child and becomes a vehicle and symbol of growth. It is a staple in any nursery.